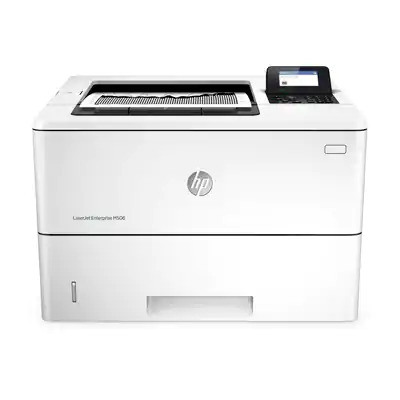 The high-speed HP LaserJet Enterprise M506dn printer is aimed at commercial and business environments. This model is very reliable and has a monthly duty cycle of 150,000 pages. The LaserJet Enterprise M506dn mono laser printer runs on a 1.2GHz processor and has a standard memory of 512MB that can be expanded to 1.5GB; an optional 500GB hard disk drive is also available. The LaserJet Enterprise M-506dn monochrome laser printer has standard Ethernet but only optional Wi-Fi. The HP LaserJet M506dn black and white printer measures 16.46 x 14.80 x 11.73 inches and weighs 25.9lbs. It comes with a small control panel with display and function buttons. For media handling, the HP LaserJet Enterprise M506dn printer has a standard 550-sheet tray and 100-sheet multipurpose tray. Optional paper trays are available for growing printing needs. The HP M506dn monochrome laser printer comes with standard Ethernet, making it easy to share among workgroups. It also has a duplexer for automatic double-sided printing. The speed of the HP LaserJet Enterprise M-506dn printer can go as fast as 45ppm. Users can expect crisp and readable documents as this model offers a maximum resolution of 1200 x 1200dpi. The Wi-Fi print server as well as a USB cable for the LaserJet M506dn monochrome printer must be bought separately. This model doesn’t offer a USB host for direct printing from thumb drives and to support PC-free printing.